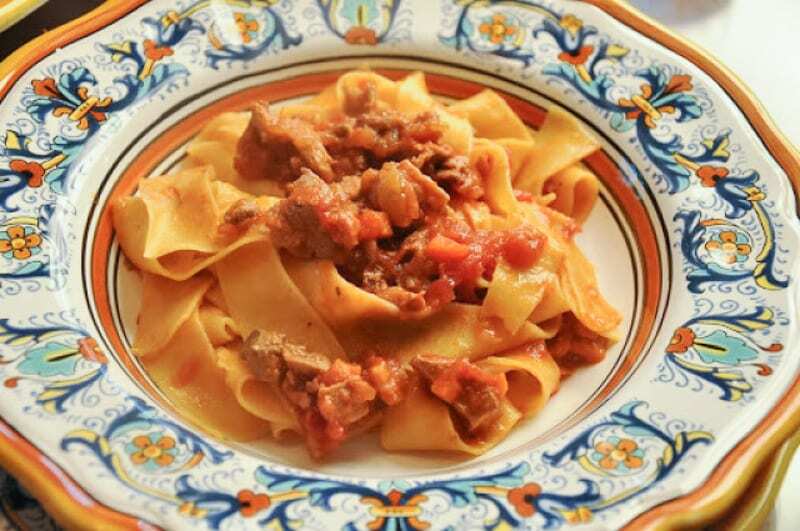 When one thinks of Tuscan cooking, one of the first dishes that comes to mind—along with such icons as fagioli all’uccelleto and bistecca alla fiorentina—is pappardelle sulla lepre, a wide ribbon pasta with hare sauce. Its fame is perfectly justified; it is truly delicious. Finding hare is just about impossible where I live now, so I have cast about looking for substitutes. Rabbit would seem an obvious choice, being unusual but not impossible to find. But rabbit actually has a quite different, much milder and less gamy, flavor from that of hare. Although a completely different animal, I find that duck fits the bill better. Made using a similar technique, it captures the ‘gaminess’ of pappardelle sulla lepre if not the exact flavor. And it is, in any event, not merely a substitution, but a traditional Tuscan dish in its own right: pappardelle all’anatra, or Pappardelle with Duck Ragu. 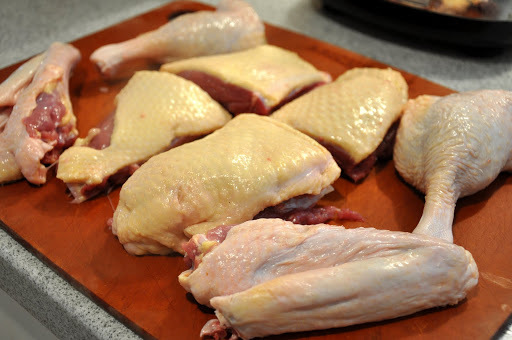 Step 1: Cutting up the duck: You begin by cutting up your duck into eight pieces, in the same manner you would a chicken: two wings, two legs and the breast, separated from the back and cut vertically down the breast bone and then each half itself cut in half across its midriff into four pieces. The cut up duck, ready for cooking, should look like the photo at right. As you cut up the duck, make sure trim off any excess fat and skin from around the cavity or the neck. (Do not throw this away—see notes below.) The back, the neck and the giblets (other than the liver) can be used to make an excellent stock, in the same way you make broth. Step 2: Getting the sauce started: Then make a battuto of red onion, carrot, celery, a few sage leaves and pancetta, all finely minced. To make short work of the task, you can pulse these ingredients in a food processors (having roughly chopped them beforehand to ensure an even consistency) until you have a fine mince, almost—but not quite—a paste. Sauté in abundant olive oil until very soft, then push what is now a soffritto to the edges of the pot and add the duck pieces, turning them frequently and allowing them to brown lightly on all sides. Season with salt and pepper and then splash a generous amount of red wine into the pot, turning the contents to allow them to absorb the wine. Step 3: Braising: When the wine is entirely reduced, add a large can of peeled tomatoes, crushed with your hands or passed through a food mill, into the pot. Then tomatoes should nearly cover the duck pieces. If not, add water or broth. Cover partially and allow the duck to braise for an hour, stirring from time to time. If the sauce seems to be drying out, add a bit of water or broth. But more likely, the sauce will be a bit thin after an hour, so uncover and allow the sauce to reduce slowly for another 30 minutes or so. Step 4: Finishing the sauce. A few minutes before the sauce is done, remove the duck pieces from the sauce. You can do one of three things with them: (1) you can keep them warm and eat them as a secondo after the pasta, accompanied by the vegetable contorno of your choice, (2) you can serve them on top of the pappardelle as a one dish meal or of piatto unico or (3) you can remove the meat from the bones and remove the skin from the meat, then chop the meat roughly and return it to the sauce. Personally, I prefer the third option, as duck that has braised this long tends to be a bit too dry for my taste to eat on its own. If you want to serve the duck as a secondo, some recipes call for braising the duck whole rather than in pieces which provides a better presentation and will also help avoid overcooking the duck meat. When the sauce is done—it should be well reduced and darkened—skim the excess fat from the surface. Depending on the duck, there may be quite a lot of excess fat. Some recipes call for you to make the sauce ahead and cool it, to allow you to remove the fat, but I find this is unnecessary and, in any event, you do want some fat in the sauce to add flavor and help it coat the pasta. Step 6: Making and saucing the pappardelle: Meanwhile, you can be making your pappardelle by mixing fresh pasta dough, rolling it out quite fine and cutting it into strips 2-3cm (1 inch) wide. In the alternative, if you lack the time or the energy to make your own, there are some quite fine pappardelle available commercially. Boil the pappardelle in abundant salted water until slightly underdone. Drain (but not too well) and return the pappardelle to the pasta pot, then add a few ladlefuls of the duck sauce, mix well, and allow the pasta to simmer in the sauce over moderate heat until it has almost entirely absorbed the sauce. Pour into a warmed serving dish and ladle additional sauce over the pasta. Serve your Pappardelle with Duck Ragu with grated parmesan cheese on the side for those who want it. Try to find a smallish duck for making the ragu. Most recipes call for a duck of around 1 kilo (about 2 pounds) but it may be hard to find a duck that small. Most ducks in the US are four pounds and up. Also, try to find a fairly lean duck, like a Muscovy. Ducks, like the ones used for making Peking duck, can be excessively fatty. There are a good number of possible variations for Pappardelle with Duck Ragu: The use of red onion is typical of Tuscan cookery but if you don’t have a red onion on hand, a white or yellow one will do fine. Some recipes call for the addition of parsley or nepitella or even fennel seeds to the sauce as it simmers. Given the size of many modern ducks, some recipes call for using only the breast, which works fine, but you lose some flavor—and there is much flavor in the bones and the thighs. You can make a duck ragù by mincing the duck breast finely and adding it to the soffritto, as if you were making a ragù alla bolognese. Some recipes, conversely, call for using only the duck legs, which tend to be more flavorful (if less tender) than the breast, and hold up better to a long braise. Some recipes call for prosciutto rather than pancetta in the battuto, and/or white rather than red wine. Some recipes call for braising the duck in tomato paste diluted in broth rather than canned or fresh tomatoes. Add, finally, some recipes for Pappardelle with Duck Ragu call for fresh or dried wild mushrooms for an even more rustic effect. Cutting up the duck: You begin by cutting up your duck into eight pieces, in the same manner you would a chicken: two wings, two legs and the breast, separated from the back and cut vertically down the breast bone and then each half itself cut in half across its midriff into four pieces. The cut up duck, ready for cooking, should look like the photo at right. As you cut up the duck, make sure trim off any excess fat and skin from around the cavity or the neck. (Do not throw this away—see notes below.) The back, the neck and the giblets (other than the liver) can be used to make an excellent stock, in the same way you make broth. Getting the sauce started: Then make a battuto of red onion, carrot, celery, a few sage leaves and pancetta, all finely minced. To make short work of the task, you can pulse these ingredients in a food processors (having roughly chopped them beforehand to ensure an even consistency) until you have a fine mince, almost—but not quite—a paste. Sauté in abundant olive oil until very soft, then push what is now a soffritto to the edges of the pot and add the duck pieces, turning them frequently and allowing them to brown lightly on all sides. Season with salt and pepper and then splash a generous amount of red wine into the pot, turning the contents to allow them to absorb the wine. Braising: When the wine is entirely reduced, add a large can of peeled tomatoes, crushed with your hands or passed through a food mill, into the pot. Then tomatoes should nearly cover the duck pieces. If not, add water or broth. Cover partially and allow the duck to braise for an hour, stirring from time to time. If the sauce seems to be drying out, add a bit of water or broth. But more likely, the sauce will be a bit thin after an hour, so uncover and allow the sauce to reduce slowly for another 30 minutes or so. Finishing the sauce. A few minutes before the sauce is done, remove the duck pieces from the sauce. You can do one of three things with them: (1) you can keep them warm and eat them as a secondo after the pasta, accompanied by the vegetable contorno of your choice, (2) you can serve them on top of the pappardelle as a one dish meal or of piatto unico or (3) you can remove the meat from the bones and remove the skin from the meat, then chop the meat roughly and return it to the sauce. Personally, I prefer the third option, as duck that has braised this long tends to be a bit too dry for my taste to eat on its own. If you want to serve the duck as a secondo, some recipes call for braising the duck whole rather than in pieces which provides a better presentation and will also help avoid overcooking the duck meat. Making and saucing the pappardelle: Meanwhile, you can be making your pappardelle by mixing fresh pasta dough, rolling it out quite fine and cutting it into strips 2-3cm (1 inch) wide. In the alternative, if you lack the time or the energy to make your own, there are some quite fine pappardelle available commercially. Boil the pappardelle in abundant salted water until slightly underdone. Drain (but not too well) and return the pappardelle to the pasta pot, then add a few ladlefuls of the duck sauce, mix well, and allow the pasta to simmer in the sauce over moderate heat until it has almost entirely absorbed the sauce. Pour into a warmed serving dish and ladle additional sauce over the pasta. Serve your Pappardelle with Duck Ragu with grated parmesan cheese on the side for those who want it. Thanks, guys! Do try it if you have the chance, the taste is really lovely. @Lydia, grazie, sei davvero troppo gentile! Mi hai ispirato, ci provero'!!! I made this the other night, it was gorgeous! Thanks so much for sharing – I now understand what a Soffrito is too! Duck pasta! That sounds amazing – and congrats on the 1/2 Hr Meals interview! Tu fai un'ottima cucina italiana. Perchè non provi a partecipare al contest sul mio blog? Post@ la past@, devi reinterpretare e modificare a gusto tuo una ricetta di pasta della tradizione italiana. I premi sono molto belli, solo che la ricetta dovrebbe essere in italiano!!!! This is fantastic! I just bought wide ribbon pasta and was wondering what to make of it. Since I love duck too, I would definitely try this recipe, even though I wouldn't use rabbit for my pasta – I own pet rabbits, so I don't want to scare them to death ;-). Mmm, never heard of pasta with duck, sounds like a good combination. Love this! I think I will try it with duck, although rabbit sounds like a good substitute also…hmmm, what a dilemma!